A poll released Wednesday by Reuters/Ipsos/University of Virginia Polling Center showing Rep. Beto O’Rourke (D-TX) leads incumbent Sen. Ted Cruz (R-TX) by two points is an outlier that used a significantly different methodology from other polls that show Cruz in the lead. According to the Reuters/Ipsos/UVA Poll of likely voters in Texas, O’Rourke leads Cruz, 47 percent to 45 percent. The Reuters/Ipsos/UVA Poll results stand in marked contrast to the Quinnipiac University Poll released on Tuesday, which shows Cruz with a nine point lead over O’Rourke, 54 percent to 45 percent, as well as the current Real Clear Politics Average of Polls, which shows Cruz with a 4.5 percent lead. In an exclusive interview with Breitbart News, Chris Jackson, vice president of Ipsos, which conducted the Reuters/Ipsos/UVA Poll of Texas likely voters for Reuters and the University of Virginia Polling Center, agreed with the characterization that the poll results were an outlier. “Both polls are outliers,” he said, referring to the Reuters/Ipsos/UVA Poll released Wednesday and the Quinnipiac Poll released on Tuesday. He pointed out that most other recent polls show a very close race, with Cruz leading by just two to four points. “This race is a toss-up,” Jackson added. These are findings from an Ipsos poll conducted September 6 – September 14, 2018 on behalf of Thomson Reuters and the University of Virginia Center for Politics. For the survey, a sample of roughly 2,000 adults age 18+ from Texas were interviewed online in English. The sample includes 992 likely voters, 423 likely voter Democrats, 463 likely voter Republicans, and 90 likely voter Independents. From September 11 – 17, Quinnipiac University surveyed 807 Texas likely voters with a margin of error of +/- 4.1 percentage points, including the design effect. Live interviewers call landlines and cell phones. (1) The Ipsos Poll was conducted online, while the Quinnipiac Poll was conducted by live interviewers over landlines and cell phones. (2) The Ipsos Poll was conducted over a nine day period, while the Quinnipiac Poll was conducted over a seven day period. Most polls are conducted over a three to four day period in order to grab a “snapshot” of attitudes during a specific period of time. (3) The Ipsos Poll interviewed all adults, then screened out those adults who are not registered to vote or are not likely to vote. The Quinnipiac Poll only interviewed likely voters. (4) The Ipsos Poll over sampled Hispanic voters and under sampled White voters, when compared to actual 2016 voting behavior in Texas. One difference between the two polls is in the weighting methodology they use for respondents by ethnic group/race. 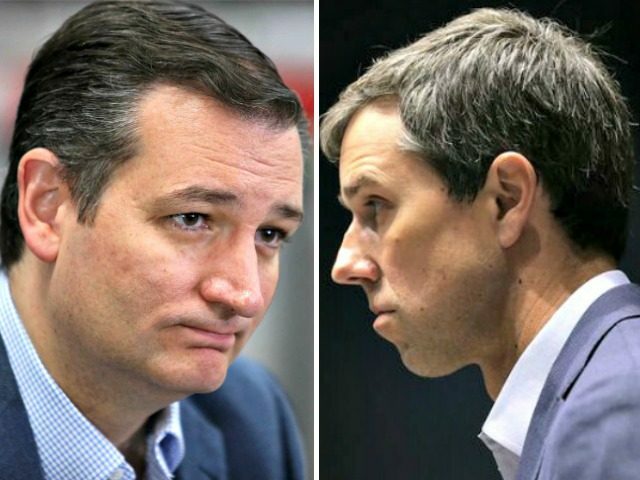 Jackson told Breitbart News that Hispanic voters comprised 23 percent of the weighted sample of the 992 likely voters included in the poll showing O’Rourke with a two point lead. Jackson added that 32 percent of the larger sample of 2,000 adults over the age of 18 interviewed for the poll were Hispanic. “The Reuters/Ipsos/UVA poll was conducted online, in English, from Sept. 5 to 17. It surveyed between 992 and 1,039 people in each of five states including California and weighted the responses according to the latest government population estimates,” the Reuters article announcing the poll results on Wednesday reported. White voters comprised 58 percent of the weighted sample, Black voters comprised 13 percent, and “Other” comprised six percent. The Ipsos Poll under sampled White voters by four percent, compared to actual 2016 voter turnout, and over sampled Hispanic voters by three percent compared to actual 2016 voter turnout. This is significant, because the Ipsos Poll showed O’Rourke with a 37 point lead over Cruz among Hispanics (64 percent to 27 percent), dramatically different from the nine point lead the Quinnipiac Poll showed O’Rourke had over Cruz (54 percent to 45 percent). Ted Cruz leads Beto O’Rourke by a 60 percent to 33 percent margin among White likely voters. Beto O’Rourke leads Ted Cruze by a 64 percent to 27 percent margin among Hispanic likely voters. Beto O’Rourke leads Ted Cruz by a 78 percent to 14 percent margin among Black likely voters. Ted Cruz leads Beto O’Rourke by a 47 percent to 44 percent margin among “Other” likely voters. Ted Cruz leads Beto O’Rourke by a 66 percent to 32 percent margin among White likely voters. Beto O’Rourke leads Ted Cruz by a 54 percent to 45 percent margin among Hispanic likely voters. Beto O’Rourke leads Ted Cruz by a 97 percent to 3 percent margin among Black likely voters. Though Hispanics comprised 39 percent of the total population of Texas in 2014, according to Pew Research, they accounted for only 20 percent of votes cast in Texas in the 2016 presidential election. 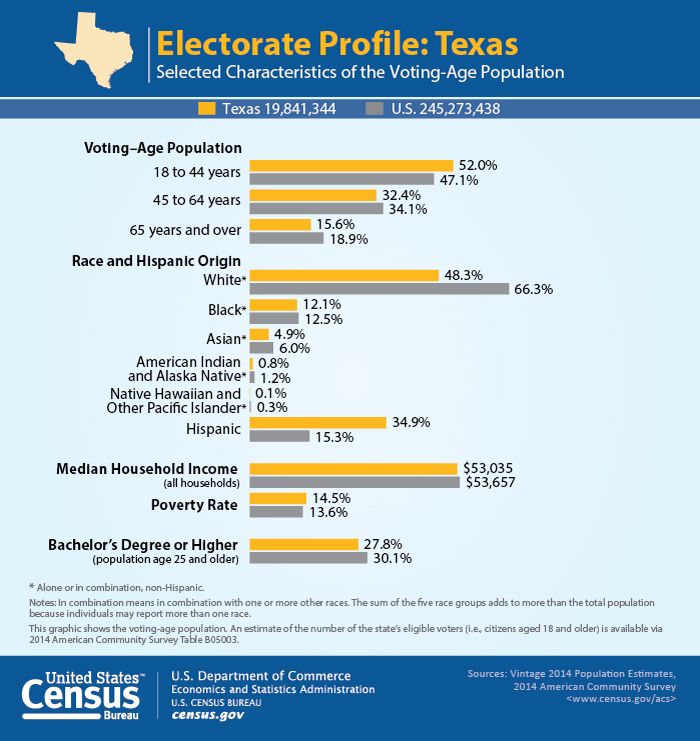 That same year, in 2014, according to the U.S. Census Bureau, 48 percent of the voting age population in Texas was White, 35 percent was Hispanic, 12 percent was Black, and five percent was Asian. Hispanic turnout in the 2016 presidential election in Texas, and for a number of previous elections in Texas, has been dramatically lower than White turnout and Black turnout. In 2016, for instance White voter turnout in Texas was slightly higher than 60 percent, Black voter turnout in Texas was slightly lower than 60 percent, and Hispanic voter turnout was 40 percent. Breitbart News asked the Quinnipiac Poll to provide their demographic breakdown of poll respondents by ethnic group/race used in the recent Quinnipiac Poll of the Texas Senate race, but has not received a response. However, it appears that the weighting methodology for ethnic group/race used in the Quinnipiac Poll results showing Cruz with a nine point lead is very close to the actual voting behavior during the 2016 presidential election in Texas. The Reuters/Ipsos/UVA Poll results released for polls conducted in the other four states were more in line with the current Real Clear Politics Average of Polls. In the California Senate race, Sen. Dianne Feinstein (D-CA) leads challenger Kevin Leon by 20 points, 44 percent to 24 percent among likely voters. Thirty-nine percent of the population of California in 2014 was Hispanic, the same percentage as in Texas, according to Pew Research. In the Arizona Senate race, Rep. Kyrsten Sinema (D-AZ) leads Rep. Martha McSally (R-AZ) by three points, 47 percent to 44 percent among likely voters, which is 1.5 points higher than the current Real Clear Politics Average of Polls, which gives her a 1.5 point lead. Thirty-one percent of the population of Arizona in 2014 was Hispanic, according to Pew Research. In the Nevada Senate race, Sen. Dean Heller (R-NV) leads Rep. Jacky Rosen (D-NV) by three points, 46 percent to 43 percent among likely voters, which is different from the current Real Clear Politics Average of Polls, which gives Rosen a lead of less than one percent. Twenty-eight percent of the population of Nevada in 2014 was Hispanic, according to Pew Research. In the Florida Senate race Republican Gov. Rick Scott leads incumbent Sen. Bill Nelson (D-FL) by one point, 46 percent to 45 percent, almost exactly the same as the 1.6 point lead he has in the current Real Clear Politics Average of Polls. Twenty-four percent of the population of Florida in 2014 was Hispanic, according to Pew Research.